Mwche Lodge at Mwche Cottages in Llanybri, near Llansteffan, Carmarthenshire sleeps 4 people. 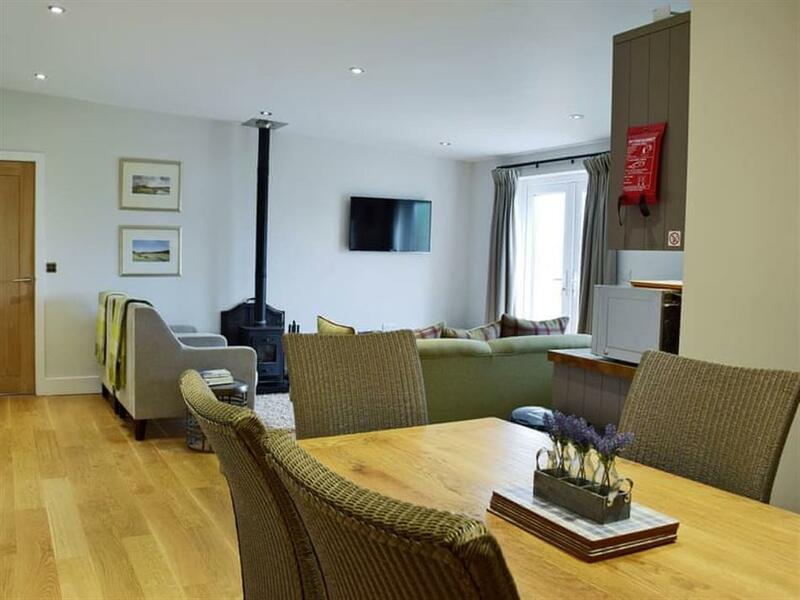 Mwche Cottages near Llansteffan; Mwche Lodge really offers the ultimate spot to unwind and relax in this beautifully presented, single-storey detached lodge with truly epic sea views along the Taf Estuary and further out towards Carmarthen Bay and Llansteffan Beach. Mwche Lodge has been finished to a very good standard throughout with oak flooring, bright and airy rooms and offers an open plan living space with a contemporary style kitchen, perfect for cooking that special meal. In the evening, cosy up in front of the focal wood burner after a busy day, or on balmy summer’s evenings, open the French doors and take in the fresh sea air while relaxing in the wood fired tub (on request). From the property you can see the famous poet Dylan Thomas’s Boat House within the township of the idyllic Laugharne. Here you can visit the local pub which he frequented regularly. The walled town of Tenby with its award-winning beach is within a 40-minute drive, along with Oakwood, Wales’ largest theme park, Folly Farm Zoo and Heatherton World of Adventure. The beach is 1½ miles from Mwche Cottages near Llansteffan. With the shop 1½ miles, and the pub & restaurant is 1 mile from Mwche Cottages. 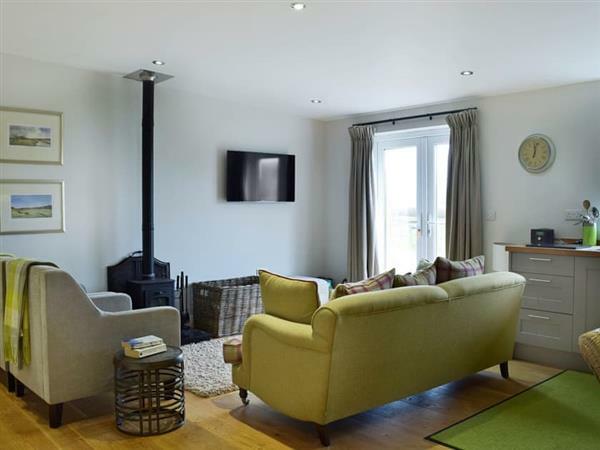 Mwche Lodge can been booked together with Mwche Farmhouse (ref UK11013 [Mwche Farmhouse]) which is set within the grounds, to sleep up to 14 people. Mwche Lodge is all on the ground floor. Living area: With wood burner, 42’’ Freeview Smart TV, CD player and French doors leading to patio. Kitchen area: Galley style with electric oven, electric hob, microwave, fridge, dishwasher and coffee machine. Shower room 2: With walk-in shower, toilet and heated towel rail. LPG central heating, electricity, bed linen, towels and Wi-Fi included. Initial logs for wood burner included. Travel cot and highchair available on request. Welcome pack. Terrace with garden furniture. 2 dogs welcome, to be kept on a lead at all times. Private parking for 2 cars. No smoking. Please note: There is a pond in the grounds, 20 yards away. Holidays at Mwche Lodge, Mwche Cottages run from Friday to Friday. Pets allowed at Mwche Cottages - Mwche Lodge. For a better idea of where Mwche Cottages - Mwche Lodge is, you can see Mwche Cottages - Mwche Lodge on the map below. Mwche Cottages - Mwche Lodge is in Dyfed; should you be on the lookout for a special offer, you can find all the special offers in Dyfed. It's always worth checking to see what is on offer at the moment. Do you want to holiday near Mwche Cottages - Mwche Lodge (UK11014), you can see other cottages within 25 miles of Mwche Cottages - Mwche Lodge; have a look to find your perfect holiday location.